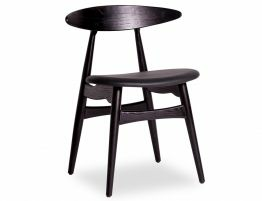 Our Joffery oak dining chair effortlessly pairs curves and sculptural lines to bring a mid century modern feel to your dining space. 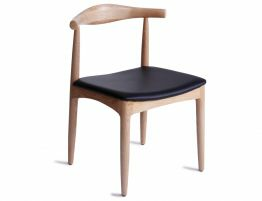 This mod dining chair or side chair offers an updated throwback to the 60s with its Danish modern furniture forms, its imaginative retro lines and natural oak wood. 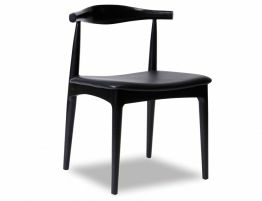 Use these designer dining chairs around your dining table. Use these as highly styled task chairs in your office or home office. 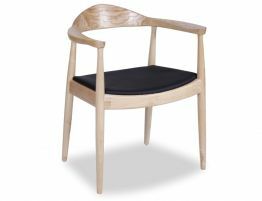 These dining chairs in oak echo the very best of Danish mid century modern furniture characteristics with sleek natural wood and expertly crafted details. A curved backrest provides comfortable back support and adds to the look of the chair. 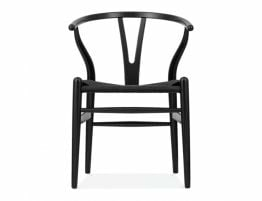 The Joffrey dining chair is crafted from solid oak wood that has been given a smooth lustrous finish and a black seat pad offers a bit of extra comfort and a textural contrast to the smooth wood frame.